I’m a big believer in making recipes that fit the season, and one of my favorite end-of-summer fruits are blackberries! 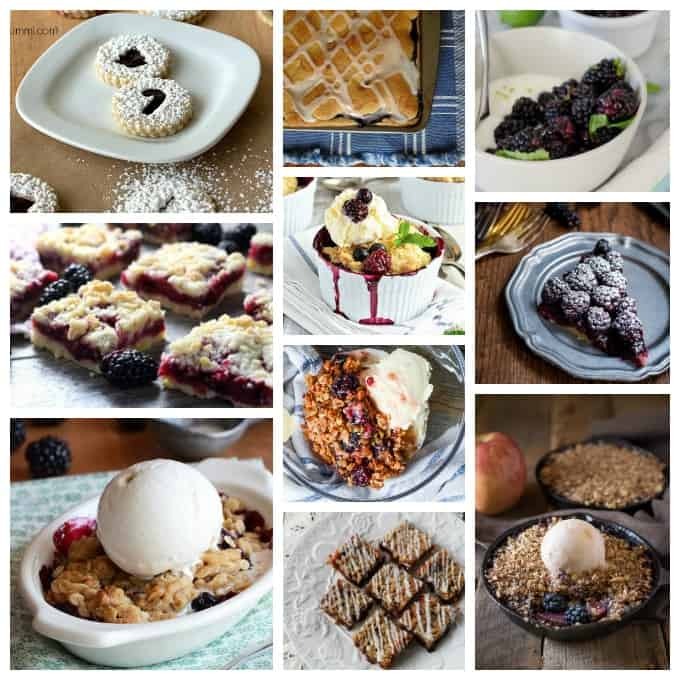 There are so many delicious blackberry recipes out there I thought I would put a tasty collection together for you.Of course you’ll find blackberry desserts in this post, but there are also blackberry recipes for drinks, sauces, spreads and breakfast foods. 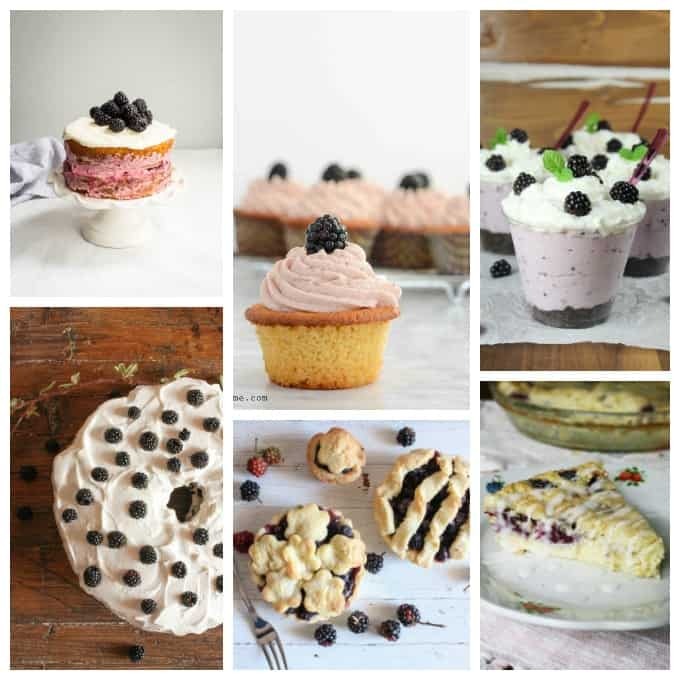 I was really happy to find so many blackberry recipes I want to try! I knew there were plenty of dessert recipes made with blackberries, but I was pleasantly surprised by the diversity of this fruit. From breakfast to dessert and plenty in between! I always think of the holidays when I see Linzer cookies, and these Blackberry Linzer Cookies from It’s Yummi are making my mouth water! These Blackberry Pie Squares are an absolute potluck favorite around here. I make these for barbecues, parties and holidays and they are always a hit. If you love to indulge in whole, fresh blackberries, these Blackberry Mint Yogurt Bowls from Delish Knowledge are right up your alley. I’m a huge fan of bar desserts, so these Blackberry Crumb Bars from Chocolate with Grace have definitely been added to my list of things to bake. Oh my word, did you see this gorgeous Black and Blue Berry Cobbler from TidyMom? I can’t wait to make this, it’s perfect for early fall! Wow, anything with a smooth liquor, like these Bourbon Blackberry Jam Bars from Girl in the Little Red Kitchen, are definitely worth a try. I think this Blackberry Crisp from Ann’s Entitled Life could be my next homemade dessert! If you love a good crisp for dessert, you will definitely want to print off this Blackberry Crisp for One from An Edible Mosaic. My Blackberry Cheese Streusel Bars are perfect for dessert, afternoon tea or breakfast! How gorgeous is this Apple and Blackberry Crumble baked in a cast iron pan from Culinary Ginger? A classic dessert, this Blackberry CobblerBlackberry Cobbler is one of my all time favorites! If you know a fellow blackberry fan with a birthday coming up, this beautiful Blackberry Lemon Naked Cake from Girl in the Little Red Kitchen would be perfect. Blackberry Lemon Cupcakes from A Healthy Life for Me would make for a gorgeous edible party centerpiece. There’s no question, I must try this No Bake Blackberry Cheesecake from Miss in the Kitchen! Homemade Angel Food Cake from An Italian in my Kitchen becomes exceptional when garnished with fresh blackberries. Reminiscent of the farmer’s market, these Fresh Blackberry Mini Pies from An Italian in my Kitchen look positively scrumptious. If you’ve ever had impossible pie, you’ll really love this Blackberry Coconut Impossible Pie version! A nice break from the heat are these cool Blackberry Cheesecake Popsicles from Belly Full. Make your own fruit pops, like these Frozen Fruit Ice Pops from The Homespun Hydrangea. 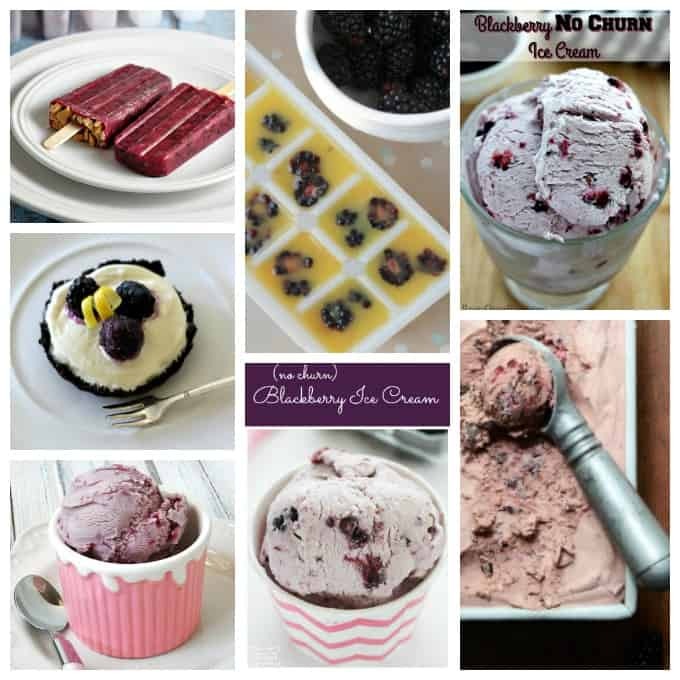 Use fresh blackberries to make this Blackberry No Churn Ice Cream from Reuse Grow Enjoy. Add this Chocolate Crust Mini Ice Cream Tart from Carolyn’s Homework to your list of must try recipes. My Vanilla Blackberry Jam Ice Cream is made from jarred jam, perfect for your homemade blackberry jam. Here’s another freshing Homemade Blackberry Ice Cream from Passion for Savings. No Churn Blackberry Dark Chocolate Cheesecake Ice Cream from An Edible Mosaic sounds amazing as well! We know from “pork chops and applesauce” that fruit goes great with pork. Try these Pork Chops with Blackberry Peach Sauce from Lemons for Lulu on for size. Looking for a refreshing change of pace? 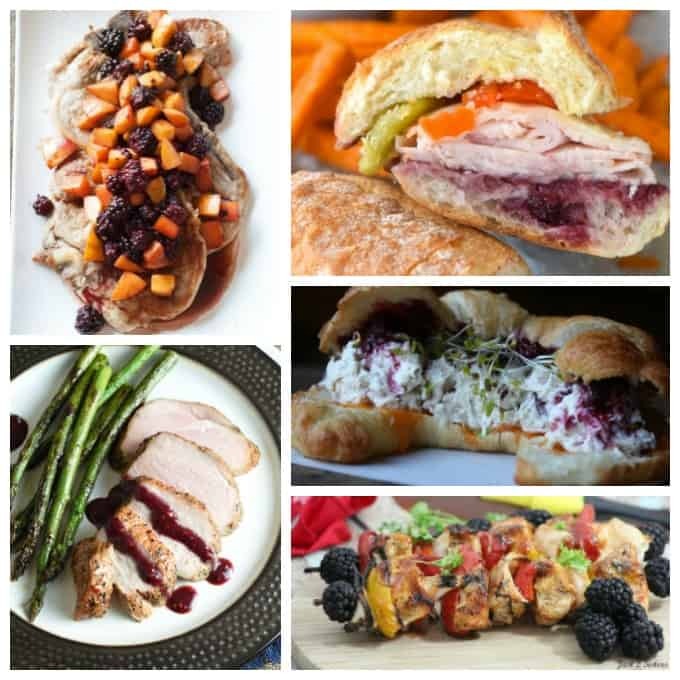 This Blackberry Turkey Sub sandwich from Wine and Glue sounds delicious. I bet this Chicken Salad and Blackberry Croissant from Daily Appetite is to die for! Doesn’t this Peppercorn and Garlic Pork Roast with Blackberry Sauce from Belly Full look amazing? Summer isn’t over yet, so try these Chicken Kabobs with Blackberry BBQ Sauce from Just 2 Sisters tonight! Blackberry Lemonade from The Red Head Baker is a great way to cool off! Try a Blackberry Mint Ginger Fizz from Grey is the New Black this weekend. 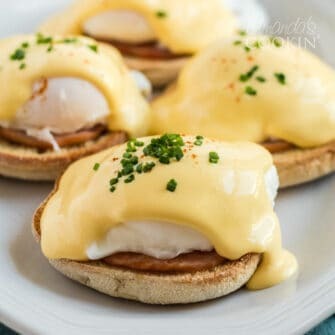 Need some fruit in your breakfast? This Blackberry Vanilla Smoothie from Artsy Momma will start your day off right. Cocktail hour? Mix up this lovely Blackberry Gin Martini with friends. 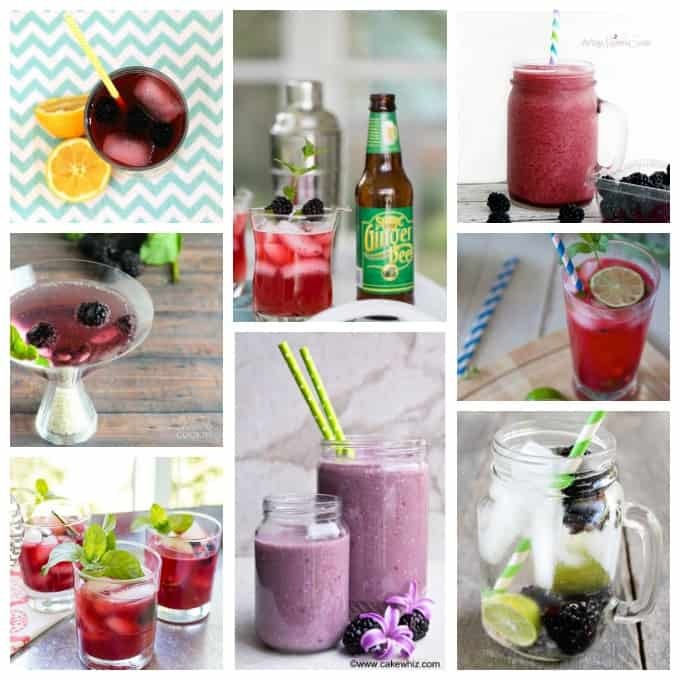 I’m loving these Blackberry Mojitos from Colorful Eats Nutrition! Here’s a refreshing Blackberry Cocktail from Grey is the New Black perfect for the weekend. This Blackberry Smoothie from Cake Whiz is great for those that are on the go. Enjoy a Blackberry Lime Spritzer from Creative Green Living on a warm summer evening. If you love homemade jams and jellies, try this Blackberry and Apple Jam from The Purple Pumpkin Blog. These little Blackberry Cream Cheese Coffee Cake and Mini Cakes are so delicious! This Blackberry Refrigerator Jam from Ann’s Entitled Life is a great alternative to heat canning. You’ve seen similar danishes in the store, and this gorgeous Braided Blackberry Breakfast Danish makes for an amazing presentation. 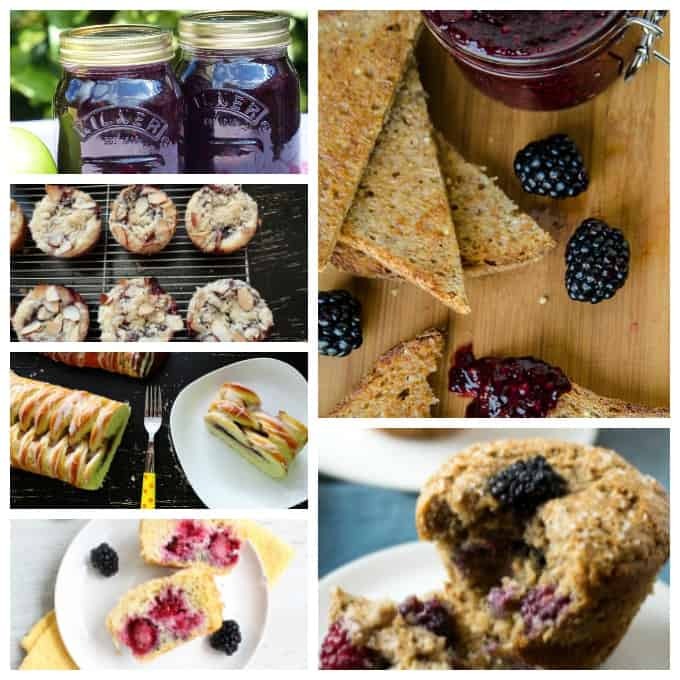 Tr Table for Seven’s Blackberry Muffins with Lemon Glaze for great after school snacks. If you are gluten intolerant, these Gluten Free Blackberry Almond Flour Breakfast Muffins from Fearless Dining are perfect! 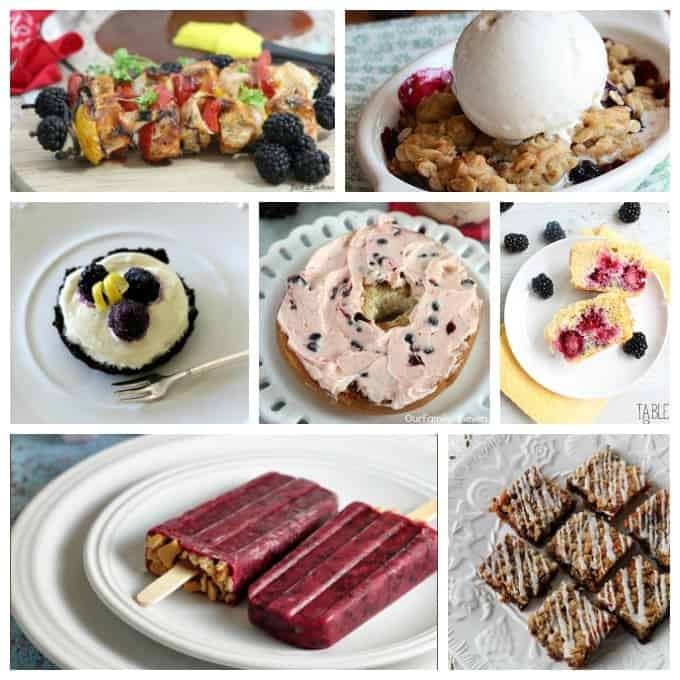 Do you have any favorite blackberry recipes? I’m always looking for more, so please feel free to share in the comments!